The discussion below provides an example relating to US Dollar (USD) transactions; however, the calculations are similar with other non-domestic funds transactions. Only the exchange rates differ. Let’s make a $1,000 sale, for example, with a standard exchange rate of 1.38. Note that the sales are converted to Canadian dollars. The conversion of the revenue inventory and cost of goods accounts accomplishes proper accounting for the entry as well as ensuring that the profit margin is reported correctly. When the A/R ledger is printed, it shows the individual invoice in the funds they were sold in: in this case U.S. funds. This method allows you to view the A/R and print statements in the correct funds. When the A/R is printed, a conversion value is shown on the A/R ledger to reflect the value of the accounts receivable in Canadian dollars. The accounts receivable value for each customer is adjusted for the current exchange rate at the time of printing. When the customer pays the outstanding invoice and the payment is deposited into the Canadian dollar bank account, the exchange rate will, most likely, be different. For this purpose, we will use an exchange rate of 1.3742. You now have a variance of $5.80 in the Currency Exchange account resulting from this series of transactions. This variance will be posted to the income statement as a gain/(loss) on the currency exchange transactions at the end of the period. The procedure for calculating the gain/(loss) is shown later. Make a $2000.00 purchase from a U.S. vendor for additional inventory. Use the standard exchange rate of 1.38. Note that the inventory is converted to Canadian dollars so that the inventory will be correctly and accurately valued. The individual product in inventory will be removed from inventory and expensed using the landed cost in Canadian dollars. When the A/P ledger is printed, it shows the individual invoices in the funds they were purchased in: in this case in U.S. funds. This method allows you to view the A/P in the correct funds. When the A/P is printed, a conversion value is shown on the A/P ledger to reflect the value of the accounts payable in Canadian dollars. The accounts payable value for each vendor is adjusted for the current exchange rate at the time of printing. When the invoice is paid and the check clears the bank, the exchange rate will, most likely, be different. For this purpose, we will use an exchange rate of 1.3710. You now have a variance of $18.00 in the Currency Exchange account resulting from this series of transactions. This variance will be posted to the income statement as a gain/(loss) on currency exchange transactions at the end of the period. The procedure for calculating the gain/(loss) is shown later. There are three factors which are used to calculate the gain/(loss) on currency exchange transactions. These are the outstanding U.S. accounts receivables balance, the outstanding U.S. accounts payables balance and the balance in the U.S. funds bank account. 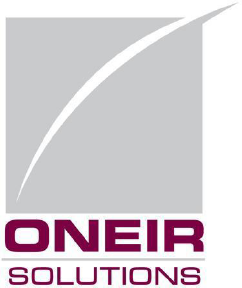 At the end of the period, usually at the end of the month, adjust the currency exchange factor in the INITIALIZATION section of Oneir to reflect the current exchange rate. Then print the accounts receivable ledger and the accounts payable ledger. At the end of the report, the conversion amount will be printed. We will use an exchange rate of 1.3812. At the end of the month, the Accounts Receivable, Accounts Payable and bank balance should be reconciled and compared to the General Ledger control accounts. In order to verify the A/R and A/P, simply set the exchange rate to 1. Then print the A/R and A/P aged ledger. Compare the total value on the report with the value shown in the A/R and A/P control accounts. In the case of the A/P, be sure that the Accounts Payable control account and the A/P deposits to vendors control account are combined before comparing with the A/P aged ledger. In a similar way, the Accounts Receivable control account and the A/R deposit from customers control account need to be combined before comparing with the A/R Aged ledger. Be sure not to forget to reset the currency exchange rate back to its correct amount in the INITIALIZATION section after you have printed the reports. The U.S. funds bank account should also be reconciled using the bank reconciliation procedures in the general ledger. At the end of the period, particularly at year-end, the balance sheet accounts which are shown in U.S. funds must be converted to Canadian dollars. In order to carry this out, the following reversing entry must be posted in the General Ledger. Using the previous example, conversion rate set at .3812. This will leave the end of the period balance in the Currency Exchange Balance Sheet account at zero.